What Is The Blackberry Q5? The Blackberry Q5 address the concerns of many who felt that the latest Blackberry models are overpriced by offering a budget version of the popular Q10 model. The Q5 is being hailed as the Q10’s little brother since it shares the same design, the latest BB10 operating system and many of the same features. The most noticeable difference is the lightweight plastic body and the downgraded 3.1 inch LCD screen which features a 720 x 720 pixel resolution. 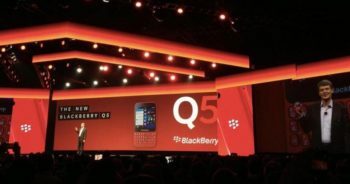 Initially, the Q5 is being marketed only to selected developing markets including parts of Europe, the Middle East, Latin America, Africa and the Asia Pacific region. Blackberry is often a common choice among business owners looking to issue corporate phones to employees, so the news of a budget version will be most welcome. However, like any internet enabled device the Q5 may present businesses with some concerns regarding security especially when it comes to data and online communications. When handed a company cell phone many employees fall prey to the temptation of thinking of it as a free cell phone and forget that there are strings attached. Many business owners have experienced high cell phone bills thanks to their employees making personal phone calls and text or from eating up data allowances browsing the net and going on Facebook. Not only is this expensive in terms of high phone bills, but also in terms of lost man hours. Employees are paid to work – not chat to friends. If they are spending all of their time on personal matters then they are not working efficiently. When employees are using smartphones to access company information they may be putting sensitive data at risk, especially if they are using public WiFi networks. Even although employees may be trained in accessing this data securely, there is always going to be occasions where they are lax with procedures in order to save time. These security issues are by no means Blackberry specific, they are disadvantages of all smartphone. The good news is that these security features can be addressed using cell phone spying. For business owners choosing to use the Blackberry Q5 as corporate issue cell phones, these threats and others can be minimized by using cell phone spying software. These apps can be installed on all company owned Q5s and will remain undetected by employees while allowing management to monitor all cell phone activity. Most cell phone spying tools include GPS location monitoring. This is ideal for keeping tabs on employees out in the field. If the boss suspects that employees are claiming to be visiting clients, but are really sitting at home then this tool will provide evidence to prove it. In order to monitor personal use, cell phone spy tools also allow access to complete call logs showing the number contacted, the call duration and the time stamp. It will be easy to identify calls that do not match business contacts. Text messages and emails can also be abused for personal use and if a spy app is installed these can be intercepted even when wiped from the original phone. This is often useful if it is suspected that employees are sharing confidential information with competitors. With the great internet capabilities consumers have come to expect, but at a much lower cost, the Blackberry Q5 could be the ideal choice for supplying employees with a corporate cell phone. However, like all smartphones these devices come with their own potential threats to security and efficiency. With the help of a reliable cell phone spy app it is possible to minimize these risks allowing the Q5 to be used to its full potential without compromising the business.